We love our attendees of Repository Fringe to take a really active part in the event so there are many ways you can take part! The easiest way to be a part of Repository Fringe is to attend! 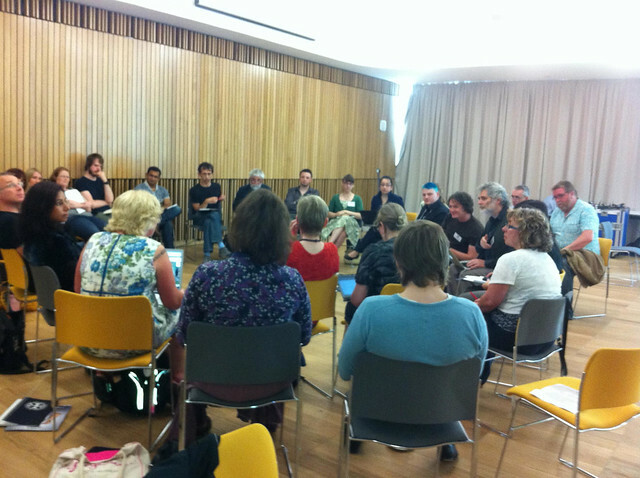 You can reserve your free place at Repository Fringe 2013 by heading over to our registration page. Present a paper, a Pecha Kucha, etc. Indicate your interest in presenting on the registration form, or email your ideas to us, and, as long as your suggestion looks relevant and interesting to the repository community, we will be delighted to find you a suitable slot in the programme. We prefer to offer a wider array of shorter presentations so this is a great event to become expert in making your presentations concise and engaging! Whether or not you want to facilitate a session you are encouraged to suggest ideas for round tables and similar discussions – we know that you are the experts on key topics and would love to see the current hot topics reflected in our discussions! Our developer challenge is open to all – bring your ideas, your skills and your inspiration! A great place to get started is our Crowdvine site – create your profile and start sharing your ideas, build your team, share your repository enthusiasm! We are currently approaching and looking for sponsorship for Repository Fringe 2013. Please email repofringe@gmail.com for more information.